According to a news article, residents of the island of St.Vincent reported smelling sulfur in towns as far S as Kingstown. This sparked fears among the population that volcanic activity had increased at Soufriere St. Vincent. Staff from the Soufriere Monitoring Unit of the Seismic Research Unit visited the volcano and reported that there was no increase in volcanic activity according to monitoring-station data and observations. The increased scent of sulfur in towns was attributed to a southward shift in wind direction towards the towns, rather than the usual E direction. Accordingly, the Alert Level remained low at Soufriere St. Vincent. Widespread sulfurous odors and haze during mid-February 2005 on the island of St. Vincent and as far as the Grenadines (50-75 km S) led some people to conclude that the smells reflected increased output of volcanic gases from the Soufrière volcano, St. Vincent, a possible harbinger of an eruption. Sulfurous odors are common on the volcano's W flank, but less frequent on other parts of the island. Scientists determined that typical winds diminish the sulfurous odors over much of the island, and the onset of the odors resulted from changes in wind patterns rather than increased gas output or other demonstrable changes. The Seismic Research Unit (SRU) collaborates with a small local unit called the Soufrière Monitoring Unit (which operates from the Ministry of Agriculture in Kingstown). The following report on the subject comes from SRU's Richard Robertson. "During the night of 16 February and most of the day of 17 February there were widespread reports of sulfurous smells throughout southern St. Vincent and as far as the Grenadines. The day of the 17th was hazy; people put these two things together and came up with the conclusion that the volcano was acting up. The sulfur smell is unusual since the wind direction is such that most of the smell from the fumaroles at the summit of the volcano gets blown out to sea and is usually only smelt by a few residents on the eastern flank of the volcano. "[SRU] . . . worked with Ms. Aisha Samuels, the head of the local volcano monitoring unit, to first investigate the report and later to quell fears that the volcano was doing anything unusual. We determined very early on that nothing serious was happening, since we have seismic stations both on the volcano and throughout the island [figure 3], none of which had recorded any increased seismicity. Further, we had just completed a GPS campaign on the island during January 2005, which revealed nothing unusual. It also involved two days of measurements on the summit of the volcano during which scientists were in very close proximity to the vent from which future eruptions will [likely] originate. Figure 3. A sketch map showing the island of St. Vincent, including Soufrière volcano, other volcanic centers, geographic features, and Seismic Research Unit monitoring instrumentation (as of February 2004). January 2005 discussion of the instrumentation noted that it then included five seismic stations, eight GPS stations, and several dry-tilt sites. Courtesy of SRU. "We quickly determined that the reported 'activity' was due to an unusual southerly wind combined with the phenomena of Sahara dust which is common around this time of the year in St. Vincent and which results in very hazy conditions. However, to completely rule out the possibility of anything unusual happening in the crater that may not have been possibly detected by our various measurements, we advised the local Unit that they should visit the crater summit the next day (18 February)." That visit found nothing out of the ordinary. Accordingly, SRU did not think it necessary to update their website since it was so insignificant—"'a 10 day wonder' as they say in the West Indies, or a 'pseudo-crisis.'" Such reports are common for St. Vincent and the entire region. Information Contacts: Richard Robertson, Seismic Research Unit, The University of the West Indies, St. Augustine, Trinidad (URL: http://www.uwiseismic.com/); Aisha Samuel, Soufriere Monitoring Unit, Ministry of Agriculture, St. Vincent. "Disturbed conditions" have been noted from the air in the crater of . . . Soufrière in St. Vincent. Rising steam and a strong sulfurous smell have been reported coming from the water in the crater lake . . . . The condition was first noted by a pilot who flew over Soufrière on 31 October. His report was confirmed 1 November by a government official who flew over the crater in a small plane." William C. Buell IV (Washington, D.C.) reports that Soufrière is a "very dangerous" volcano and that the heat level has recently risen from 20 to 84°C, a very significant change. An island 100 m in diameter and 2 m high appeared in the lake center on 20 November. This island consists of angular blocks 1-10 m across and appears to be the top of a lava dome standing 200 m above the former lake floor. The water level is rising faster again with a 38-cm increase in the last 48 hours, but the temperature at the lake edge remains steady at 82°C. A 10-second series of explosions like thunder was heard on 20 November within the crater but the source was not seen because of hot vapor concealing most of the lake. No clear volcanic earthquakes have been recorded, although a seismograph 6 km SW of the summit has recently recorded indeterminate signals of 10-60 second duration. More seismographs are being installed and close watch continues. Information Contacts: Card 1313 (08 November 1971)John F. Tomblin, Seismic Research Unit, University of the West Indies, St. Augustine, Trinidad; Bridgetown Radio, Barbados. Card 1319 (23 November 1971)John F. Tomblin, Seismic Research Unit, University of the West Indies, St. Augustine, Trinidad. "The islands which appeared on 20 November have grown in height and in numbers and they have coalesced to form a continuous land mass in the southeastern part of the lake. This land mass is 50-feet in height at the highest point as of 28 November, and the area covered by this larger island is over 100 m in diameter. This island is composed largely of three E-W trending ridges of a black massive rock. In addition, a number of pinnacles and small islands are sticking out of the water NW of this larger island. The lake temperature remains between 79-80°C at the margin of the lake. The lake level has been dropping; it dropped a couple of feet in the last three days. "I have a report that there has been some leakage or seepage at the flank of the cone of the crater lake waters. The crater lake waters have found an outlet through the flank of the cone and are seeping out. This may account for some of the drop in water level. Earthquakes have been recorded on our seismograms for the last five days, between 10 and 18 events per day. These are not felt; they are instrumental, that is, recorded. There are four seismometers on St. Vincent now; one on the rim of the crater, two on the crater flank, one in Kingstown. There is one tiltmeter site being set up on the eastern flank of the volcano. "There have been no volcanic explosions, or any emission of steam or gases, and all that has happened since 31 October is the extrusion of a very viscous dome-forming lava onto the floor of the crater. This lava dome is gradually emerging above the water level, higher and higher at approximately 4-6 feet per day. It seems to rise as a continuous mass and there are no disturbances of any sort except for the minor tremors which we have started to record." The eruption continues as before with emission of lava into the crater. The level of the water in the crater lake has dropped 3.1 m since 3 November. This drop can be accounted for entirely by evaporation and there is no evidence of leakage through the crater wall. The lava island in the crater lake was visited on 13 December by Haraldur Sigurdsson and Peter Baker in a dinghy and it was found that the water temperature increased from 74°C at the lake margin to 90°C at a distance of 10 m from the island. Water in contact with the island was boiling vigorously. The island is 30 m high above lake level and is approximately 600 m in length along its longest axis NW-SE. The rate of rise of the island has slowed down, and the major growth is now lateral by very slow extension of blocky lava lobes and ridges radiating from the central region. Five kilograms of rocks were collected from the southern end of the island. These are samples of plagioclase-phyric dark gray basaltic andesite with sparse phenocrysts of olivine and pyroxene. In the period from 8 to 14 December only three events have been positively identified as local earthquakes. In addition, 40-60 minor seismic events are being reported every 24 hours by high-gain seismographs close to the crater rim. These events have a fairly constant frequency of 2.5 Hz and are propagated outward from the crater at a surface velocity of 2-3 km/s. Visual observations and timing of events and processes on the island have permitted correlation of some of the larger tremors with rockfall and lava creep. Information gained since our last report gives grounds for optimism with regards to events in the Soufrière and we consider that the probability of a violent eruption is decreasing. A chemical analysis of the lava collected on 13 December is now available and supports our former identification of a basaltic andesite, with a silica content of 55.3% and an overall composition virtually identical to the numerous basaltic andesite lavas of the Soufrière, which are the products of a quiet outpouring of lava from the crater. No local earthquakes have been recorded by tremors associated with rockfalls on the island continue to occur. The lack of significant seismic activity supports our interpretation of the present events as a relatively quiet eruption of a gas-poor lava. Observations. Table 1 summarizes observations at the crater. Table 1. Summary of Soufriere St. Vincent crater observations, 15-31 December 1971. Courtesy of the Seismic Research Unit. 15 Dec 1971 93 feet 72°C -13 ft. 3 in. 16 Dec 1971 96 feet 71°C -13 ft. 10 in. 17 Dec 1971 97 feet 69°C -15 ft. 0 in. 18 Dec 1971 97 feet 69°C -16 ft. 9 in. 20 Dec 1971 99 feet 69°C -19 ft. 6 in. 21 Dec 1971 102 feet 69.5°C -20 ft. 9 in. 23 Dec 1971 109 feet 69.5°C -23 ft. 3 in. 24 Dec 1971 109 feet 70.0°C -24 ft. 2 in. 25 Dec 1971 110 feet 70.5°C -25 ft. 6 in. 26 Dec 1971 110 feet 70.5°C -26 ft. 6 in. 27 Dec 1971 110 feet 69.0°C -27 ft. 3 in. 28 Dec 1971 not measured 66.0°C -28 ft. 0 in. 29 Dec 1971 115 feet 66.0°C -29 ft. 5 in. 31 Dec 1971 118 feet 64.0°C -31 ft. 6 in. The island has now reached a height of 120 feet above water level and continues to grow in area as new lava spreads laterally in the lake. The main areas of growth are the radial ridges to the N and SE. New observations of the process of growth indicate that the sequence of events is as follows: hot molten lava is extruded below water level at the base of the ridges and, as this lava comes into contact with the lake water, minor steam explosions are generated. Some of these explosions breach the surface of the lake near the island as areas of boiling water, and are followed by the spread of a red-brown stain which probably consists of stirred-up sediments from the lake bottom. Many of these minor explosions dislodge rocks from the island which have been made unstable by general ridge expansion. These minor explosions accompanied by rockfalls are the most likely source of the numerous minor tremors which are recorded by the seismographs close to the summit. Water temperature at the observation point on the S edge of the lake has dropped from 74°C to a nearly constant value of 69°C. This may be a local phenomenon, due to relatively small output of lava into the southern part of the lake in the last few days, and we believe that other inaccessible regions of the lake are hotter. The drop in lake level has accelerated slightly in this period and is now approximately 1 foot 6 inches every 24 hours. Sigurdsson and Baker went boating on the crater lake on 21 December and carried out a series of bathymetric soundings along a profile from the S shoreline towards the island (table 2). Unfortunately, this survey had to be abandoned due to unfavorable conditions on the lake. The distance from the S shore of the crater lake to the island is approximately 12 m.
Table 2. Summary of depth and temperature measurements in the Soufriere St. Vincent crater lake, 21 December 1971. Courtesy of the Seismic Research Unit. The survey indicates a maximum depth of 33 fathoms in this profile, at a distance of 38 fathoms from the S shore. Closer to the island the water depth starts decreasing at a rapid rate. Rumors of warm water in the stream S of Windsor Forest village were checked by ground observations on 17 December and found to be untrue. This stream is at a temperature of 25°C and the Falls of Baleine at 23°C. Five seismograph stations continue to operate on a 24-hour basis but three of these stations are within 2 km of the crater. These three stations continue to record the tremors discussed above, and attributed to growth processes in the lava island. No sub-surface earthquakes have been recorded in this period nor have any earthquakes been reported felt. Composition of the lava. A chemical analysis of the rock samples collected from the island on 13 December is now at hand and the following table is an average of three determinations. Table 3. 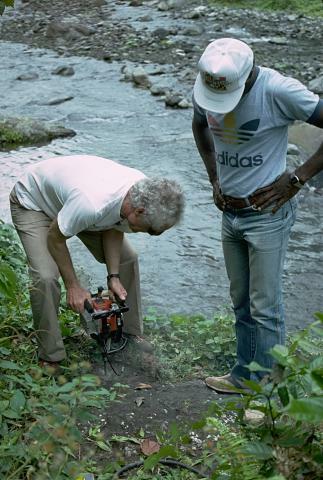 Chemical analysis of Soufriere St. Vincent samples from the island in the crater lake collected on 13 December 1971. Data is the average of three determinations; analysis was done by the U.S. Geological Survey. Courtesy of the Seismic Research Unit. The composition of the lava is that of a basaltic andesite, virtually identical with older Soufrière lavas such as those at Warbishy River, in the cliffs around the Larikai River, Morne Ronde Point, Campobello Bay, and the numerous lava flows which form the cliffs surrounding the Soufrière crater. The new lava is significantly more basaltic, i.e., lower in silica (55.3%) than the products of the most violent phases of the 1902 eruption, which were more andesitic in composition, with silica content of 56-58%. Interpretation. In volcanic eruptions in general the most silica-rich products appear first, when the risk of violent eruptions and explosive activity is greatest. Products of later stages of an eruption have a lower silica content and are less explosive. We therefore expect that as the present eruption proceeds, lavas with progressively lower silica content will be erupted. All evidence therefore leads us to the conclusion that the likelihood of explosive activity is very small at this time and will become progressively smaller. Were the Soufrière eruption to enter an explosive phase, this would be preceded by major changes in seismic activity and other observable phenomena for at least one or two days. Information Contacts: Card 1321 (01 December 1971)Haraldur Sigurdsson, Seismic Research Unit, University of the West Indies. Card 1330 (15 December 1971)Haraldur Sigurdsson and J.P. Shepherd, Seismic Research Unit, University of the West Indies. Card 1336 (29 December 1971)Haraldur Sigurdsson and J.P. Shepherd, Seismic Research Unit, University of the West Indies. Table 1 summarizes daily measurements [during 23-31 December] at the Soufrière. The island is now 145 feet in height above water level, but its growth has decelerated in the last few days. The cooling of the lake to 66°C is an indication that at present very little hot lava is in contact with the water. The lake level has dropped about one foot per day in the last six days. Minor rockfalls continue to take place off the edges of the lava mass, but these are less frequent than in the past weeks as is also indicated by a slight decrease in the number of tremors recorded by the summit seismograph stations. Most of the evidence tends to suggest that there is a slight new lava being extruded at a slower rate into the crater, but whether this decrease in activity is temporary or not is too early to comment on at this stage. Information Contacts: Haraldur Sigurdsson and J.P. Shepherd, Seismic Research Unit, University of the West Indies. J. Tomblin reports the following. "In Card 1336 it was stated by Sigurdsson and Shepherd that 'the new hot lava is significantly more basaltic, i.e., lower in silica (55.3%) than the products of the most violent phases of the 1902 eruption, which were more andesitic in composition, with silica content of 56-58%.' These statements are incorrect. Table 4 contains mean values for all available wet chemical analyses of Soufrière rocks, summarized from UWI Seismic Research Special Publication No. 15 (Tomblin, 1968). Table 4. Mean values for all available wet chemical analyses of Soufrière St. Vincent rocks, summarized from UWI Seismic Research Special Publication No. 15 (Tomblin, 1968). Courtesy of John Tomblin, UWI. "From the above it is clear that there is no significant difference in silica content between lava flow and pyroclastic material erupted from the Soufrière Volcano. This writer concludes that the explosiveness of Soufrière magmas is a function of gas, not silica content, there being no direct relationship between these two components. The only noteworthy features of the above figures are that 1) aeolian differentiation of the 7-8 May 1902 ash appears to have been negligible at 100 miles but considerable at the 275-mile range; and 2) pyroclasts erupted at the end of the 1902-03 eruption were about 2% lower in silica than at the beginning of this eruption." Table 5 is a list of observations made at the crater. Table 5. Summary of Soufriere St. Vincent daily crater observations, 12 February-18 April 1972. Courtesy of the Seismic Research Unit. The increase in the rate of growth of the island which occurred on 9 February is continuing at present. The current rate of increase is 3 ft/day as compared with a rate of increase of 1 ft/day prior to 9 February, representing a 200% increase in the growth rate. While the N of the island continues to rise, the S end shows little or no increase in height. This indicates that the activity has now shifted almost entirely to the N end of the lava island. Another survey of the island is planned and would probably be carried out within the next two weeks, in order to determine the rate of increase in area of the island. The water temperature has maintained a level of about 58°C for the past week, while the water level continues to decrease at the rate of 6 in/day. Tremors in the vicinity of the crater continue to be recorded, at a rate of about 10/day for the past week. There was a temporary failure of all three seismograph stations in the vicinity of the Soufrière, between 14-15 February. However, the summit and Rabacca station are back in operation, and repairs are continuing on the Wallibou station. The current eruption is a mild one and involves the growth of a volcanic dome. It is completely different in character from the three earlier historic eruptions of the Soufrière, all of which were violently explosive throughout. It is, however, similar to the second half of the two large historic eruptions of Mt. Pelée, Martinique, in 1902-05 and 1929-32. In each of these eruptions there was an initial, highly explosive phase which lasted several months, and this was followed by a second phase in which fresh lava welled up quietly into the crater to build a dome. 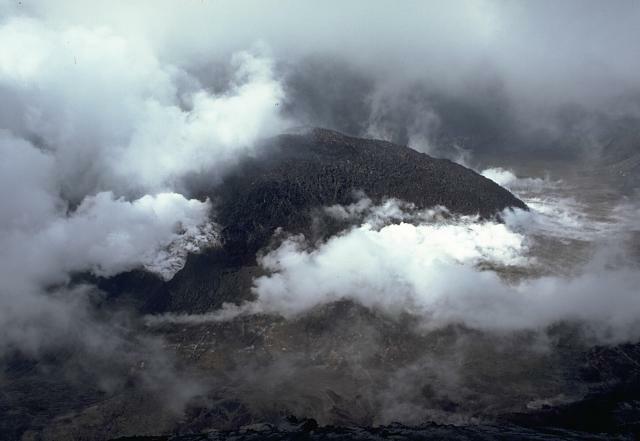 In both Martinique eruptions, dome growth continued for more than two years. Comparable periods of between six months and three years have been reported for dome building at volcanoes in other parts of the world. Thus the present eruption in St. Vincent is likely to continue for one year and could possibly continue for two. This conclusion is supported by the constancy of the rate of lava emission (~0.5 x 106 m3/day) from the beginning of November 1971 to the present, and by the small total volume so far erupted (80 x 106 m3) in comparison with the total fresh lava produced in 1902-03 (2,600 x 106 m3). The likelihood of dangerously explosive activity during the present eruption is now remote. In at least 95% of historic eruptions at similar volcanoes where there has been any explosive activity, this has begun within the first two months of the onset of eruption. The Soufrière has now been in eruption for over four months and has comfortably exceeded this initial period of high uncertainty. At the present rate of lava emission, the summit of the new dome should reach the level of the lowest parts of the crater rim by May 1972, and the crater will be almost completely filled by early 1973. The viscosity of the new lava is high so that even if the dome grows to the point at which its flanks overlap the present crater rim, it is unlikely that molten lava will escape down the mountainside. Information Contacts: Card 1350 (03 February 1972)John F. Tomblin, Seismic Research Unit, University of the West Indies. Card 1358 (23 February 1972)W. Aspinall and H.J. Almorales, Seismic Research Unit, University of the West Indies. Card 1359 (29 February 1972)John F. Tomblin, Seismic Research Unit, University of the West Indies. Observations made at the crater [are included in Table 5]. Activity at the crater has continued along the lines established three months ago. The height of the lava dome has increased by an average of about 1.5 ft/day and the lake water has continued to drop at a mean of 9 in/day. The water temperature at the lake edge, which remained constant between 56-60°C during the previous four weeks, dropped to a new low of 53.5°C on February 27. An excursion by rowboat was made on 27 February by R. Arculus and K. Willis, geology research students from the University of Durham, England. Conditions were very unfavorable, with high winds, poor visibility, and frequent rockfalls from the flanks of the dome which are now relatively steep. Consequently, it was impossible to carry out a complete sounding survey. The maximum water depth recorded was 99.5 ft, at a point approximately halfway between the island and the lake edge. This depth is 48.5 ft less than the maximum obtained during the previous sounding survey on 27 January, and confirms that the lava dome is still expanding horizontally across the former lake floor. Measurements have been made on near-vertical air photos of the crater taken on 11 February and kindly placed at our disposal by Mrs. M. Barnard. These indicate that the dome is approximately circular in plan at water level with dimensions on 11 February of 590 m (1,970 ft) from N to S, and 540 m (1,800 ft) from E to W.
On 28 February, a re-triangulation by theodolite was carried out by R. Waters of the Directorate of Overseas Surveys. This showed that the dome had expanded to 640 m (2,130 ft) in N-S diameter at water level and 590 m (1,970 ft) from E to W. This represents an increase in both horizontal dimensions at water level by 50 m in the last 17 days. Approximately 7 m of this increase is apparent and not real, i.e., due to the drop in water level between 11-27 February. The true amount of horizontal expansion of the dome is therefore 44 m.
The W half of the dome is now 10-20 feet higher than the E half, and the two halves are still separated by a N-S valley. The N part of this valley is the most actively steaming area of the dome. The dome summit was 295 ft. above current lake level on 27 February. The only local seismic activity consists of small tremors which continue to originate close to the crater. Between 10-20 such events are currently occurring per day. There have been no deeper or larger earthquakes of the kind which we would expect to see prior to a major increase in the scale of the eruption. On the other hand, the shallow tremors have decreased to about one-quarter of their rate of occurrence in early December, without any decline having taken place in the rate of injection of new lava into the dome. All available evidence indicates that the eruption will neither end nor become violent in the early future. The risk of a dangerous eruption is now remote and will continue to decrease with time. However, so long as this continues, the present monitoring system should be maintained. The eruption continues as before. The rate of rise of the rocks has decreased slightly to about one foot per day but the rate at which the water level is dropping is still about nine inches per day. The water temperature shows a downward trend and reached a new low of 51°C on 8 March, but this was followed by rise to 57°C by 10 March. The most noticeable feature of this period has been the very small number of crater tremors, and no tremors have been recorded since 7 March. There is still no sign of deeper seismic activity. Rockfalls continue to be frequent. No comprehensive survey of the island has been carried out during this period but from visual observation the general shape is still as previously described. It is evident from the data of the past three weeks that activity in the Soufriere crater is very slight. The rise of the island mass slowed down on 1 March and in the period 1-22 March the total increase in island height has been 2 feet 4 inches or only 1.3 inches/day on the average. On 22 March the western summit of the island was the highest point, 226 feet. The northern peak was at 216 feet and the eastern summit at 201 feet. Water level is dropping at a slower rate than before 7 March, when the daily drop was 9 inches on the average. The present rate of drop in water level is 4 inches per day, but the lake has finally reached its pre-eruption level, 85 feet below 3 November datum. When the lake was at its highest level on November 20th, it was thus some 92.5 feet above the normal pre-eruption level. Seismic activity is low, and limited to one crater tremor per day on the average. 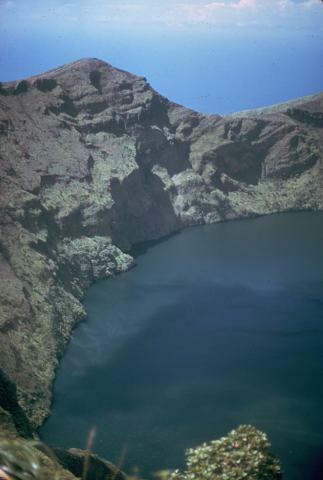 Sigurdsson and Almorales carried out a bottom survey of the crater lake on 2 March (table 6) along a profile from the south point of the island to the near shore (282 feet). The maximum depth in this area is 111 feet. Surface water temperature near the southern shore of the island is 62°C. A boat trip was made around the island and water temperature recorded at different points in the lake. Maximum temperature of 81°C was recorded in bubbling hot springs on the northern shore of the lava mass, but minimum temperature of 49°C was encountered in center of the wide bay east of the island. Table 6. Depth soundings in the southern part of the Soufriere St. Vincent crater lake, 2 March 1972. Courtesy of the Seismic Research Unit. Information Contacts: Card 1364 (07 March 1972)John F. Tomblin, Seismic Research Unit, University of the West Indies. Card 1366 (20 March 1972)J.B. Shepherd, Seismic Research Unit, University of the West Indies. Card 1370 (28 March 1972)H.J. Almorales and H. Sigurdsson, Seismic Research Unit, University of the West Indies. Since 20 March the island in the middle of the crater lake has maintained a maximum height of 226 feet on he western summit. The greatest heights on the eastern and northern summits are 196 and 211 feet, respectively. These two heights which are now considered reliable are not in agreement with the heights quoted in the previous report when the measuring poles were interfered with by other parties. Loose rocks continue to crumble off the slopes, thus narrowing the peaks and forming more lateral spread towards the base of the island. The temperature of the water at the crater edge has been decreasing by 0.5°C/day on the average since 22-31 March and an increased drop of 3° was detected three days after. The water level is now dropping at the rate of 3.5 inches per day leaving on the slopes of the crater a thin scum of muddy substance which on hardening becomes flaky and is eventually washed back into the lake by the rain. The number of crater tremors have gradually declined to one about every two days. These tremors are of shallow depths, very low magnitude and can only be detected by the summit station. This decline in seismic activity is probably due to the island not growing or the absence of new lava emitting from the crater. On 11 April 1972, H. Sigurdsson reported that "the Soufriere eruption has now ceased. Height of the lava island has remained constant at 226 feet above 3 November datum since 20 March, or some 316 feet above present water level. Crater tremors were of the order one a day since 7 March, but none have been recorded since 1 April." Information Contacts: H. Sigurdsson, Seismic Research Unit, University of the West Indies. The situation in the crater remains the same as it has been for more than a month. The island height is unchanging; loose material on the island is being washed into the lake by the rains, revealing the structure of the lave mass. Water continues to evaporate from the lake thereby reducing the lake level fractionally; the color of the water is now clearer and more translucent indicating that the sediments disturbed by the initial eruptive activity are resettling. The number of crater tremors is practically zero. The phase of lava emission appears to have come to a halt, but crater observations will continue. "There has been no further increase in the height of the island of lava since 20 March, indicating that no more lava has been introduced into the crater lake. The highest point on the island is still 226 feet relative to the 3 November datum. The water temperature continues to decrease with minor fluctuations. The temperature was 46°C on 7 May and 41°C on 11 May. The water level is decreasing at an average rate of 1.5 inches/day, as evaporation over the crater lake continues. The water level was 94 ft on 23 April, 95 ft 6 inches on 7 May and 96 ft on 11 May. The frequency of crater tremors continued on a greatly diminished scale and only six tremors were recorded during the past three weeks. The situation at the crater has maintained the current pattern over the past seven weeks. Observations at the crater will continue until a state of normalcy has been established." Information Contacts: Card 1388 (02 May 1972)J.B. Shepherd and W.P. Aspinall, Seismic Research Unit, University of the West Indies. Card 1394 (22 May 1972)H.J. Almorales, Seismic Research Unit, University of the West Indies. During the period 13-26 May 1972, the situation at the crater continued along the lines stated in the last report. The highest point on the island maintained its height of 226 feet relative to the 3 November datum. This point is now 324.5 feet above the present water level. The water temperature varied between 40-41°C. The temperature was 40°C on 15 May, 41°C on 18 May, 40°C on 22 May, and 41°C on 25 May. The water level continued to decrease, but at a slightly higher average rate, from 1.5 inches/day to 2.0 inches/day. The water level was -97 feet on 15 May, -98 feet on 22 May, and -98.5 feet on 25 May, and is now 13.5 feet below the original level of the lake. The occurrence of crater tremors was practically zero, with one tremor recorded during the last two weeks. Work on the construction of a tiltmeter station at Orange Hill is now completed. The installation of instruments, initial adjustments, and readings to establish reference levels is scheduled for the next two weeks. Information Contacts: H.J. Almorales, Seismic Research Unit, University of the West Indies. A series of powerful explosions from Soufrière produced large ash clouds and several pyroclastic avalanches, forcing the evacuation of more than 17,000 persons from the N end of St. Vincent. This eruption is particularly noteworthy because of the wide variety of observations made by various scientific teams (from land, low-flying aircraft, a high-altitude research plane, and from satellites). When these data are analyzed and integrated, the geophysical community can look forward to an unusually well-documented account of an episode of explosive island-arc volcanism. The first pre-eruption seismic event, telemetered to the Seismic Research Unit of the University of the West Indies by seismometers 3 and 9 km from Soufrière's summit, was a strong local earthquake at 1106 on 12 April, within 1 hour of the fortnightly earth tide maximum (calculated by F.J. Mauk). Seismic activity gradually increased through the day, and by 1900 about 15 clearly identifiable earthquakes, apparently B-type, were occurring per hour. Continuous harmonic tremor began to build an hour later, and within 2 hours was saturating the seismometers. A team of volcanologists and seismologists from the Seismic Research Unit arrived on St. Vincent 13 April, and were later joined by researchers from several other institutions. The first explosive activity was observed at dawn (about 0500) on 13 April. Subsequent explosive events were reported at 1115, 1700, and 2050 on the 13th, 0300 and 1200 on 14 April, 1705 on 17 April, 0635 on 22 April, and 2355 on 25 April. Analysis of infrared imagery from NOAA's SMS-1 weather satellite indicates that most of these high eruption clouds were fed briefly (less than 1/2 hour) by the volcano. The largest of the clouds, from the 17 April explosion, reached an estimated height of 18 km and ultimately grew to a diameter of 140 km. 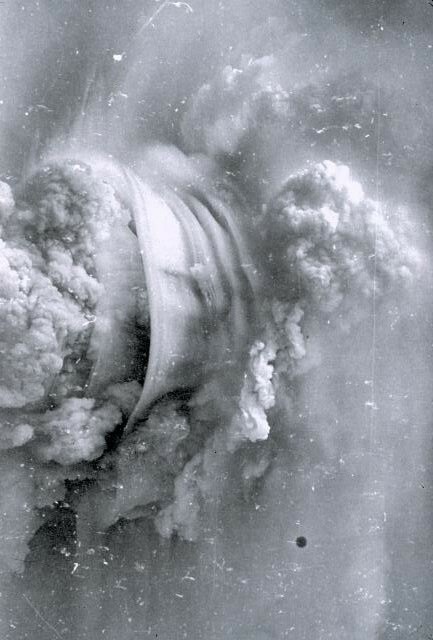 The noon explosion on 14 April produced a 100 km-diameter cloud, and two explosions on 13 April also produced sizeable clouds, 60-km-diameter at 1700 and 40 km at 2050. The first two explosion clouds on 13 April were smaller, and the explosion reported at 0300 on 14 April produced no infrared signature. Most of the explosions occurred close to diurnal earth tide maxima, and the 17 April explosion also fell on the fortnightly earth tide minimum (calculations from F.J. Mauk). A NASA P-3 Electra aircraft, equipped with lidar, a 10-stage quartz-crystal microbalance, and an NO2 remote-sensing instrument, flew through the periphery of the 17 April cloud minutes after it was ejected. Ash was collected and photographs were taken. The next evening, the NASA aircraft's lidar detected significant quantities of ejecta in the stratosphere, in patches 0.5-3 km thick with a base altitude of about 18.7 km. Scientists at NCAR, Kyushu University, and other institutions, will search at higher latitudes for stratospheric aerosols from this event. Hot pyroclastic avalanches have accompanied at least three of the explosions. The largest avalanche flowed down the Larikai River valley (figure 1) at noon on 14 April and continued beyond the mouth of the river (3 km W of the crater) several kilometers out to sea. Its deposit at the coast was 1.5 m thick, ~300 m wide, and contained scoria blocks up to 60 cm in diameter. The surface temperatureof this deposit was well in excess of 100°C when it was inspected 28 hours after emplacement. A hot avalanche from one of the earlier explosions traveled 2.5 km SE from the summit, down the Rabacca Valley, and the 17 April explosion produced numerous hot avalanches that moved down several valleys on the flanks of the cone. Figure 1. Sketch map of Soufrière and the N portion of St. Vincent, based on the map in the Catalog of Active Volcanoes of the World. Arrows show routes taken by pyroclastic avalanches, which traveled down valleys on Soufrière's flanks during at least three of the explosions in April 1979. Lengths are approximately proportional to distances traveled by the hot avalanches. Arrows labeled 1 and R indicate avalanches in the Larikai and Rabacca valleys. 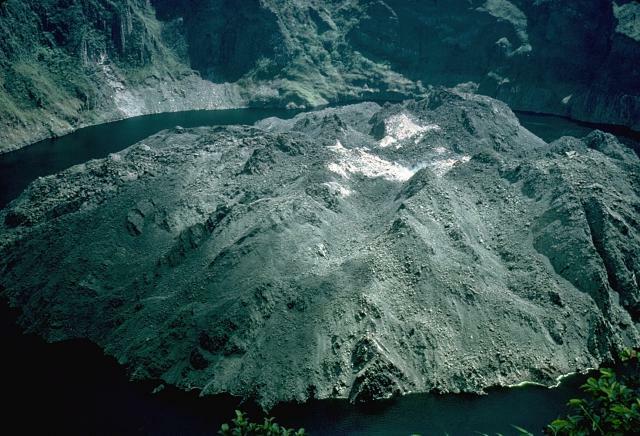 The lake and island (a lava dome extruded during the 1971 eruption) shown in Soufrière's summit crater were both destroyed during the present eruption. Rocks older than the Soufrière edifice are shown by a stippled pattern. Ashfalls from most of the explosions were limited to a few centimeters in the N portion of St. Vincent, and small amounts on Barbados, ~150 km E. However, during the 22 April eruption (figure 2) abnormal winds dropped 4 mm of ash on Kingstown (the capital of St. Vincent), on the S end of the island. Figure 2. Photograph taken shortly after the onset of the 22 April 1979 explosion of Soufriere of St. Vincent. Height of the eruption cloud is estimated to be ~6 km. Photo taken by R. Fiske. The character of the seismic activity varied considerably during the eruption. Harmonic tremor continued to saturate the instruments from 2200 on 12 April through 1600 on 14 April. Beginning at about 0900 on the 15th, a decline in tremor amplitude made it possible to identify more than 100 individual events per hour at the station 9 km from the summit. The number of individual events declined irregularly through the morning of 16 April. At about 2000 on the 16th, the seismicity changed entirely to rock fracture events, which continued until the explosion of 17 April. After this explosion, the seismicity consisted primarily of 30-50 small explosion events per hour, which could be correlated with the ejection of steam puffs that sometimes contained a little ash. Most of the later explosions were preceded by brief periods (up to 3 hours) of seismic quiet. Seismicity ended almost completely at about 0300 on 29 April. With the exception of a 20-minute period of tremor during the night of 29-30 April, the volcano has remained seismically quiet through early 3 May. . . . . The amount of tephra produced by the current eruption is about two orders of magnitude less than in 1902. . . .
Information Contacts: J. Tomblin, W. Aspinall, K. Rowley, and J. Shepherd, UWI; A. Kreuger and R. LaPorte, NOAA; M. McCormick, NASA LaRC; F. Mauk, Univ. of Michigan; R. Fiske, SI. A new phase of activity from Soufrière began in late April. At 0300 on 29 April, the seismicity that had accompanied the eruption since 12 April ended almost completely, and there have been virtually no local earthquakes since then. Katia Krafft climbed to the crater rim on 3 May and observed a small new lava dome growing in the base of the crater, the same area that had been occupied by the center of the now-destroyed 1971 dome. A sample of the new dome collected by John Tomblin in mid-May was described in hand specimen as a basaltic andesite, similar to the 1971 dome. By the end of May, the new dome had grown to ~500 m in diameter and 60 m in height. The dome's growth rate was difficult to estimate, but was probably <0.5 x 106 m3/day in late May. Virtually all of the recent expansion of the relatively fluid dome has been lateral rather than vertical. A few small explosions have taken place from the dome, but none were large enough to project material above the rim (about 300 m above the crater floor). Fumarolic activity from the top of the dome was moderately strong during the early stages of its growth, but had stopped by 20 May. In late May, fuming was still fairly vigorous around the dome, on the floor of the crater. 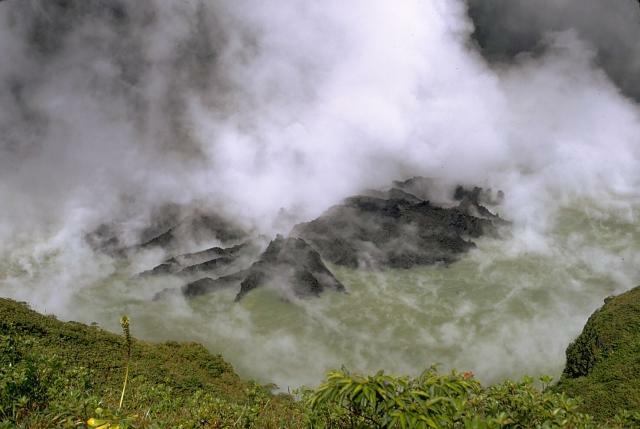 A team from Guadeloupe's volcanological observatory measured a temperature of 239°C from the fumaroles in late May, and collected samples from the dome. The April explosions deposited a total of about 30 cm of ash on the zone within 1 km of the crater rim. Large numbers of massive dense remnants of the 1971 dome and scoria blocks up to 60 cm in diameter were also found in this zone. H.H. Lamb's preliminary estimate of Dust Veil Index (Lamb, 1970) for this eruption is from 3 to 9, probably nearer to 3. The Dust Veil Index for the 1902 eruption of Soufrière was calculated at 300; the Krakatau 1883 eruption = 1,000. Much of the crater floor is presently mantled with rubble. The new dome had spread over the remnants of the old crater lake by about 20 May, but a new lake had begun to form at the beginning of June because of the onset of the rainy season. Most of the more than 17,000 evacuees were allowed to return to their homes on 14 May, including residents of the two largest towns near the volcano, Georgetown and Chateaubelair. Restrictions remain in effect for the 4,000 persons who live in the zone devastated by the 1902 eruption, N of the Rabacca and Wallibou Rivers. Reference. Lamb, H.H., 1970, Volcanic dust in the atmosphere: Philosophical Transactions of the Royal Society of London, series A, v. 266, no. 1178, p. 425-533. Information Contacts: W. Aspinall, K. Rowley, J. Shepherd, and J. Tomblin, UWI; K. Krafft, Cernay, France; H. Lamb, Univ. of East Anglia. A period of summit crater lava extrusion, accompanied by little or no seismicity, began in late April and was continuing at the end of June. Richard Fiske and Haraldur Sigurdsson descended into Soufrière's crater on 18 June. Lava extrusion continued from the same vent that produced the 1971 dome and the 1979 explosions. Blocky lava had flowed to the N wall of the crater, reaching maximum dimensions of 725 m across and 110 m high according to their tape and compass survey. The small number of flow front rock avalanches observed during their 4-hour stay may indicate a rate of extrusion substantially lower than in late April. Heavy steaming in the crater limited visibility. Since the recent beginning of the rainy season, large quantities of tephra have been eroded from Soufrière's flanks. Major mud flows that traveled down the larger valleys (mostly on the W side of the volcano) carved deep, narrow canyons, dramatically exposing pre-1979 valley fill deposits. The mudflows disrupted road crossings in the Rabacca Valley (E flank) but otherwise did little property damage. Revegetation of the areas devastated by the 1979 eruption had begun by mid-June. The zone of destruction from the 1902 eruption (N of the Wallibou and Rabacca Rivers) remains partially evacuated. Some of the several thousand evacuees work in the area during the day, but most leave at night. Information Contacts: R. Fiske, SI; H. Sigurdsson, Univ. of Rhode Island. Lava extrusion at Soufrière continued through July. Between surveys on 2 July and 4 August, the lava had expanded 30-50 m horizontally (except on the N side where it had reached the crater wall, 4:6) and about 6 m vertically, to a mean diameter of 820 m and a mean height of 85 m. Assuming 45° sides, its volume was 36.5 x 106 m3 on 4 August, having increased an average of 0.36 x 106 m3/day in July (similar to the June rate). During the August survey, some pulsing steam emission took place, mostly at the S edge of the lava, but no explosions were observed. The summit seismic station recorded 50-200 small earthquakes per day during July, but none of these were detected by instruments on the flanks. Information Contacts: J. Tomblin, UWI. Lava extrusion continued through August. However the extrusion rate has decreased during the past 3 months, as shown in table 7. The mean diameter of the lava extrusion increased from 820 m on 4 August to 832 m on 21 August, but the highest point has remained at 130 m above the crater floor since 11 August, after 13 m of vertical growth from 10 July to 11 August. Table 7. Rate of lava extrusion in the summit crater of Soufrière St. Vincent, 25 May-25 October 1979, calculated by John Tomblin. Between 50 and 200 very small local earthquakes continued to be recorded daily by the summit seismic station, but very few were detected by seismometers on the flanks. When the summit was not obscured by clouds, gentle but continuous steam emission was visible. Steam frequently rose slightly above the crater rim. Water was sometimes present in the crater, especially after heavy rains, but the volume of water remained small and water depths did not exceed ~1 m.
Extrusion of lava into Soufrière's summit crater continued through September. However, the rate of extrusion continued to decrease; the late August-late September rate was an order of magnitude less than peak values observed in mid-May. Between 21 August and 23 September, the mean diameter of the lava body grew from 832 m to 840 m, covering about 60% of the crater floor, and its maximum height increased 1 m to 131 m. Its volume was calculated at 37.6 x 106 m3. Small seismic events continued to be recorded by the summit seismograph. There has been no significant change in seismicity since a several-day increase in the number of events in late June and early July. 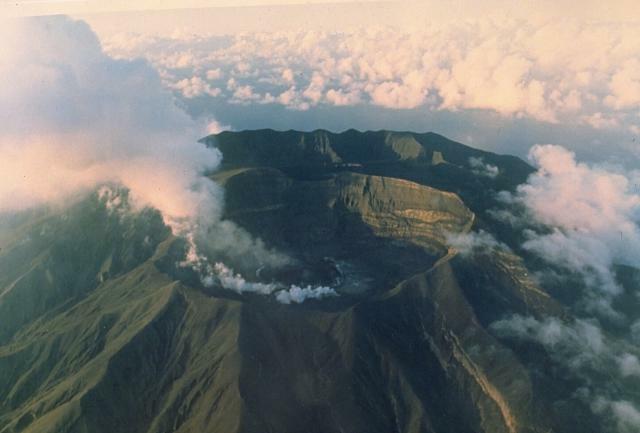 By late October, extrusion of lava into Soufrière's central crater had virtually stopped. The October extrusion rate was an order of magnitude less than that of late September and two orders of magnitude less than the May rate. The mean diameter of the lava extrusion increased by only 1.5 m between 2 and 25 October, to 870 m, and the maximum height remained ~130 m. Vigorous steaming from the lava was continuing in late October, but the number of small local earthquakes recorded by the summit seismograph had declined markedly since early October. No lava has been extruded into Soufrière's central crater since the survey of 25 October. However, monitoring of the volcano by the Seismic Research Unit, University of the West Indies, continues. Data from four seismometers are telemetered continuously to Trinidad, and scientists visit the volcano every weekend. Further References. Fiske, R., and Sigurdsson, H. (eds)., 1982, Soufrière Volcano, St. Vincent: Observations of its 1979 eruption from the ground, aircraft, and satellites: Science, v. 216, no. 4550, p. 1105-1126 (11 papers). Shepherd, J.B., Aspinall, W.P., Rowley, K.C., and others, 1979, The eruption of Soufrière Volcano, St. Vincent April-June 1979: Nature, v. 282, p. 24-28. Shepherd, J.B., and Sigurdsson, H., 1982, Mechanism of the 1979 Explosive Eruption of Soufrière Volcano, St. Vincent: JVGR, v. 13, p. 119-130. Sparks, R.S.J., and Wilson, L., 1982, Explosive volcanic eruptions - V. Observations of plume dynamics during the Soufrière eruption, St. Vincent: Geophysical Journal of the Royal Astronomical Society, v. 69, p. 551-570. 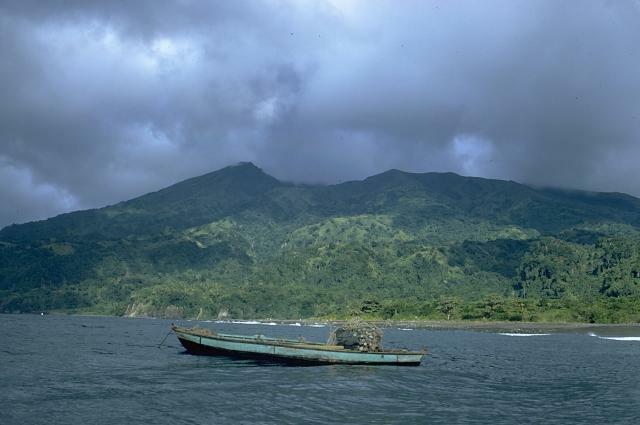 Soufrière St. Vincent is the northernmost and youngest volcano on St. Vincent Island. The NE rim of the 1.6-km wide summit crater is cut by a crater formed in 1812. The crater itself lies on the SW margin of a larger 2.2-km-wide Somma crater, which is breached widely to the SW as a result of slope failure. Frequent explosive eruptions since about 4300 years ago produced pyroclastic deposits of the Yellow Tephra Formation, which blanket much of the island. The first historical eruption took place in 1718; it and the 1812 eruption produced major explosions. Much of the northern end of the island was devastated by a major eruption in 1902 that coincided with the catastrophic Mont Pelée eruption on Martinique. A lava dome was emplaced in the summit crater in 1971 during a strictly effusive eruption, forming an island in a lake that filled the crater prior to an eruption in 1979. The lake was then largely ejected during a series of explosive eruptions, and the dome was replaced with another. Anderson T, Flett J S, 1903. Report on the eruptions of the Soufriere, in St. Vincent, in 1902, and on a visit to Montagne Pelee, Martinique. - Part I.. Phil Tran Roy Soc London, Ser A, 200: 353-553. Juang W S, Bellon H, 1984. K-Ar geochronology of volcanic rocks of St. Vincent, the Lesser Antilles. Bull Cent Geol Surv, 3: 31-43. Le Friant A, Boudon G, Arnulf A, Robertson R E A, 2009. Debris avalanche deposits offshore St. Vincent (West Indies): impact of flank-collapse events on the morphological evolution of the island. J. Volcanol. Geotherm. Res., 179:1-10. Robertson R, 2005. St. Vincent. In: Lindsay J M, Robertson R E A, Shepherd J B, Ali S (eds). Volcanic Hazard Atlas of the Lesser Antilles, Trinidad and Tobago, Seismic Res Unit, Univ West Indies, p 240-261. Robertson R E A, 1995. An assessment of the risk from future eruptions of the Soufriere volcano of St. Vincent, West Indies. Nat Hazards, 11: 163-191. Rowley K C, 1978. Stratigraphy and geochemistry of the Soufriere volcano, St. Vincent, West Indies. Unpublished PhD thesis, Univ West Indies, 282 p.
Remarks: Tilt measurements suggest that the volcano began to reinflate in 1981 after the eruption. Reference List: Fiske and Shepherd 1982. Remarks: Rapid deflation of more than 20 microradians occurred during the eruption. Remarks: Soufriere, St. Vincent gradually inflated at least 10 microradians prior to the April 1979 eruption. Soufrière volcano, seen here from the south, forms the northern end of the island of St. Vincent. Its broad, flat summit is formed by several generations of craters. The present-day, 1.6-km-wide crater, cut on its NE side by a smaller crater formed in 1812, has been the site of lava dome formation and explosive removal on several occasions since the first historical eruption in 1718. Pyroclastic flows from eruptions in 1812, 1902, and 1979 reached the coast. Photo by Richard Fiske, 1980 (Smithsonian Institution). A powerful eruption column rises above Soufrière volcano on April 17, 1979. The height of the eruption column was estimated to be 19 km. The smooth-textured "skirt clouds" in the center of the photo were produced by condensation of subhorizontal layers of moist air that were carried up by the eruption column. Photo by Keith Rowley, 1979 (University of West Indies). 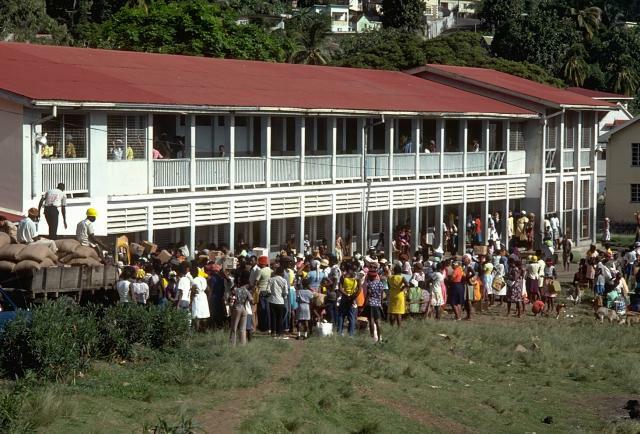 Evacuees from the 1979 eruption of Soufrière volcano pack a school building in Kingston, the capital of St. Vincent. About 15,000 people were evacuated from the northern end of the island. Most were allowed to return home on 14 May, although day-time-only access was permitted for 4000 people living within areas that had been affected by the 1902 eruption. Photo by Richard Fiske, 1979 (Smithsonian Institution). 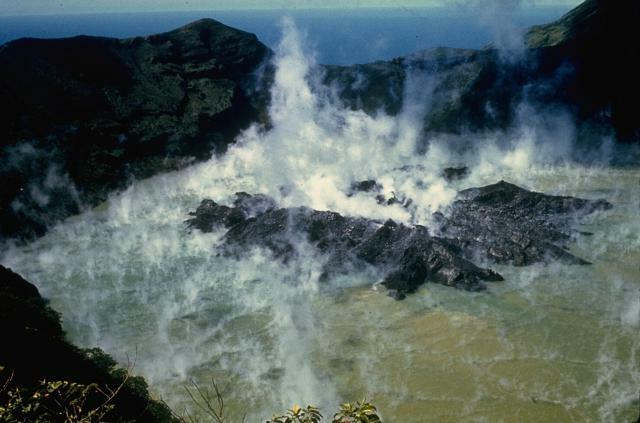 A steaming lava dome fills the floor of the summit crater of Soufrière volcano in June 1979. Both steam clouds from the degassing lava dome and atmospheric clouds are present in this photo. The dome began growing on May 3, after the cessation of explosive eruptions on April 25, and reached a height of 110 m by June 18. By the end of the eruption in October, the dome was 130-m high. A growing lava dome rises above the surface of the steaming crater lake of Soufrière volcano in December 1971. The dome first breached the surface of the lake on November 20, after extrusion began sometime in late September or early October. Its height increased at an intial rate of 2-3 m/day before it stopped growing on March 20, 1972. Unlike other historical eruptions of Soufrière St. Vincent volcano, the 1971-72 eruption was non-explosive. Photo by Jack Frost, 1971. 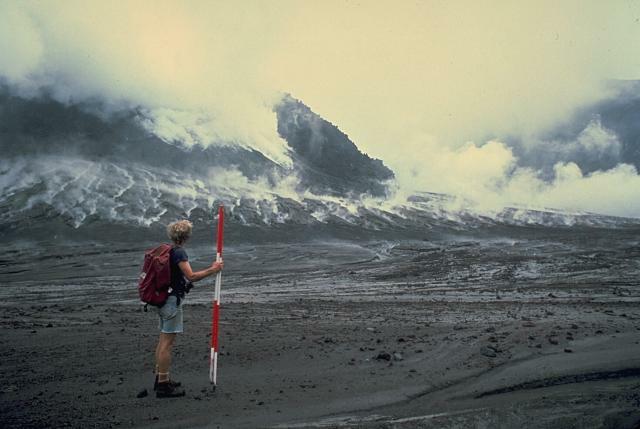 Volcanologist Haraldur Sigurdsson observes a growing lava dome in the summit crater of Soufrière volcano in November 1979 during a field expedition to conduct geodetic surveys of the dome. 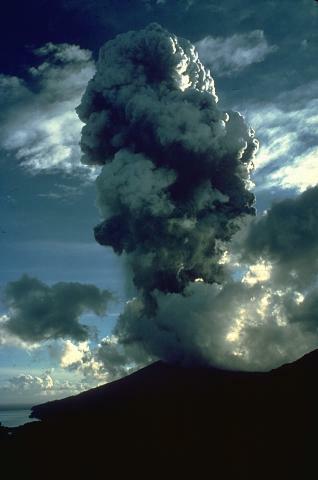 By the end of the eruption in October 1979 the dome reached a height of 130 m.
An eruption column at the right rises above atmospheric clouds on the afternoon of April 13, the first day of the 1979 eruption of Soufrière St. Vincent volcano. The ash column reached a height of 10 km. Several explosions took place on the 13th, two on the 14th, and single explosions occurred on the 17th, 22nd, and 25th. A pyroclastic flow on the 14th descended the west flank and traveled at least 10 km out to sea. Photo by John Shepherd, 1979 (University of West Indies). 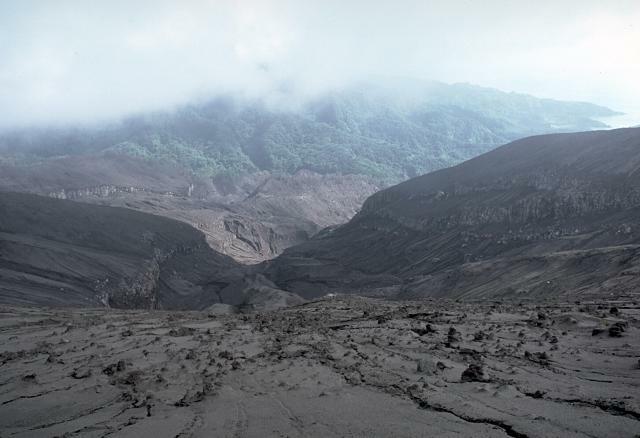 The barren area in the foreground that extends down valleys to the coast was swept by pyroclastic flows during the 1979 eruption of Soufrière volcano on St. Vincent. This photo was taken on June 1979 from the south crater rim, looking towards the west coast off the island at the right. Explosive eruptions April 13-25 were followed by lava dome growth from May to October. Prior to an eruption in 1971, the summit crater of Soufrière volcano was filled with a crater lake with a maximum depth of 180 m. Its floor was 560 m below the north crater rim. In 1971 a lava dome slowly and almost aseismically began growing on the crater floor. It first breached the surface on November 3 and eventually formed a large island that left only a narrow moat of lake water. Scientists from the University of West Indies and Smithsonian Institution make precision leveling measurements on the east flank of Soufrière volcano. 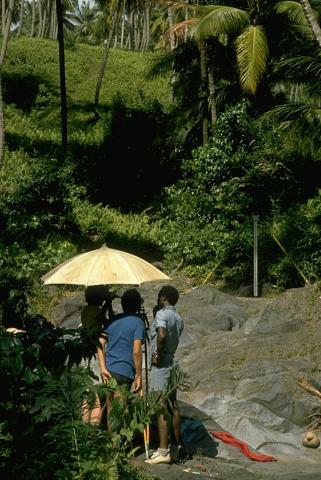 The optical leveling instrument, under the umbrella for protection from the sun, is used to measure precise differences in elevation between fixed benchmarks. Elevations are read from a stadia rod (across the dry stream bed at the right) placed on top of the benchmark. Areas of stable bedrock flat enough to conduct measurements are difficult to find on heavily vegetated tropical volcanoes. Photo by Richard Fiske, 1977 (Smithsonian Institution). 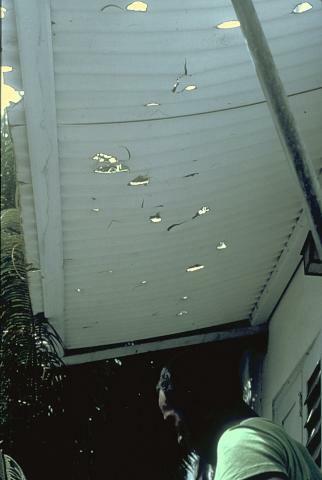 These holes in a wooden awning at the Orange Hill estate, were produced by ballistic ejecta from eruptions of Soufrière volcano. Orange Hill is located at the coast on the east flank of Soufrière St. Vincent, 7 km from the crater. 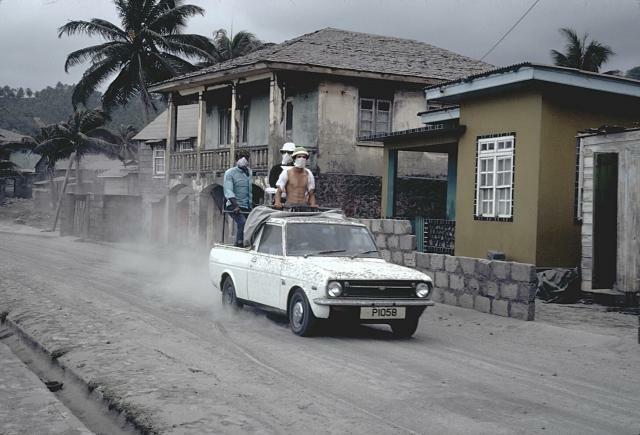 A truck filled with people evacuating the eruption of Soufrière volcano drives through the streets of the city of Georgetown, SE of the volcano, in April 1979. The riders are wearing masks because of ashfall. About 15,000 people were initially evacuated from the northern half of the island, which had been devastated by a previous eruption in 1902. 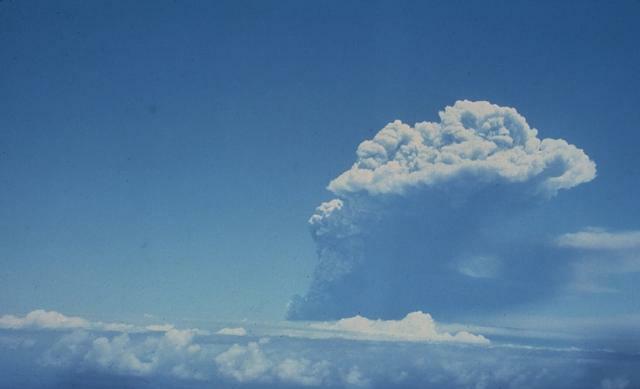 An eruption plume rises above the summit of Soufrière St. Vincent volcano on April 22, 1979. A series of powerful explosive eruptions beginning on April 13 ejected the crater lake and removed the summit lava dome. Pyroclastic flows occurred during several of the explosions and reached the west (lefthand) coast on April 14. Following the cessation of explosive activity on April 25, a lava dome began growing in the new crater on May 3. It eventually reached a height of 130 m and covered 840 m of the crater floor. 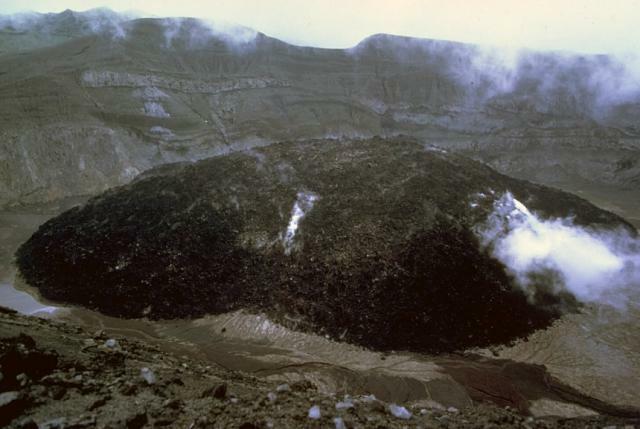 A blocky, andesitic lava dome erupted in 1971 filled much of the floor of the summit crater of Soufrière St. Vincent volcano. This 1977 photo shows the dome, which formed a 70-m-high island in the crater lake prior to its destruction during an explosive eruption in 1979. 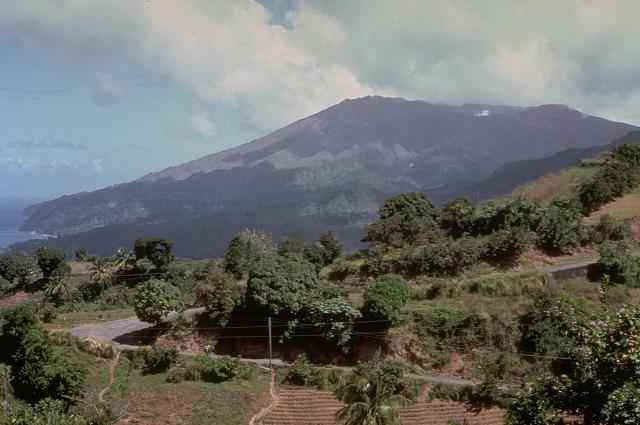 The 1971 eruption was unusual for Soufrière St. Vincent volcano in that it consisted of slow extrusion of lava that was not preceded by explosive eruptions. Photo by R. Howard, 1977 (Harvard University). Volcanologists Richard Fiske and Keith Rowley drill a boulder on the east flank of Soufrière St. Vincent volcano to install benchmarks for deformation surveys. These surveys allow detection of inflation of the volcano that often occurs prior to eruptions. Photo by John Shepherd, 1989 (University of West Indies). A steaming lava dome grows on the floor of the crater of Soufrière St. Vincent volcano in 1979. Powerful explosive eruptions that emptied the crater lake and removed the 1971 lava dome took place April 13-25. On May 3 a small lava dome appeared on the dry crater floor. By June 18 it had reached a height of 110 m and a width of 750 m. Diminishing dome growth took place until late October, by which time the dome was 130-m high. This photo was taken from the SW on May 15, during the early stages of dome growth. Photo by W. H. Hunt, 1979 (Wyle Laboratories, courtesy of National Aeronautical and Space Administration). Soufrière St. Vincent volcano forms the northern end of the island of St. Vincent. The 1178-m-high stratovolcano, seen here from off the west coast, has a broad summit. The peak at the left, the volcano's high point, is the NW rim of a large crater created by a massive volcanic landslide. The present-day, 1.6-km-wide summit crater truncates a cone (forming the flat-topped area across the saddle to the right) that was constructed within the earlier crater. Several powerful explosive eruptions have occurred in historical time since 1718. Photo by William Melson, 1972 (Smithsonian Institution). This December 1971 photo shows a lava dome rising above the surface of a crater lake on Soufrière St. Vincent volcano in the West Indies. The lake temperature rose to 80 degrees Centigrade during extrusion of the dome, but despite the extrusion of new magma in the crater no explosive eruptions occurred during the eruption. The Global Volcanism Program has no maps available for Soufrière St. Vincent. The following 270 samples associated with this volcano can be found in the Smithsonian's NMNH Department of Mineral Sciences collections, and may be availble for research (contact the Rock and Ore Collections Manager). Catalog number links will open a window with more information. Large Eruptions of Soufrière St. Vincent Information about large Quaternary eruptions (VEI >= 4) is cataloged in the Large Magnitude Explosive Volcanic Eruptions (LaMEVE) database of the Volcano Global Risk Identification and Analysis Project (VOGRIPA).